In Gymboree Play & Music we work on all areas of children’s development, from social interaction to physical activity and cognitive learning. We offer a wide variety of programs for the whole family where everyone will participate actively favourising playing and encouraging a positive parenthood. The classes take place in a environment full of fun, freedom and enthusiasm, this way children learn about themselves, about others and about the world, developing the confidence, creativity, curiosity and learning skills that they will need for life. Possibilities are endless. Classes are distributed according to age with art, music and psychomotricity activities. Playing is the most natural way of learning for children. With the program Preschool Steps we provide a unique learning experience for a child of preescholar age. Through games children build the necessary social, emotional and intellectual skills for school. Classes are specially designed for children from 3 months old to 3 years old. These skills provide a sold foundation for learning future environments. Along with Zero to Three Foundation, the National Center for Infants Toddlers, and Families, we have identifies these seven social-emotional skills as a necessity for any child in a scholar environment. The program takes place in English and with possibility of 3, 4 or 5 days a week. Baby Preschool Steps – Age from 10 to 16 months old. Initiation in the development of social skills between mutuals, knowledge and development of cognitive, motor and language skills in a trilingual environment (English-Catalan-Spanish). Meet and discover new ways of exploring the world through art, music and psychomotricity. This program takes place without parent’s attendance. Preschool steps A – Age from 16 to 24 months old. Preschool steps A – From 24 months old. More complex challenges, in this period children develop more complex social skills. 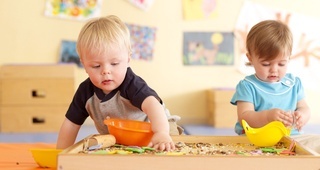 Cognitive processes accomplished and motor and language skills help them understand and play more independently in an environment without their adult of reference along with professionals of psychology and child education. This program is aimed to an excelled training for the child in future learning environments perfecting preschool skills using English. Monday to Friday from 09:00 to 13:30h and from 16:30 to 19:00h.